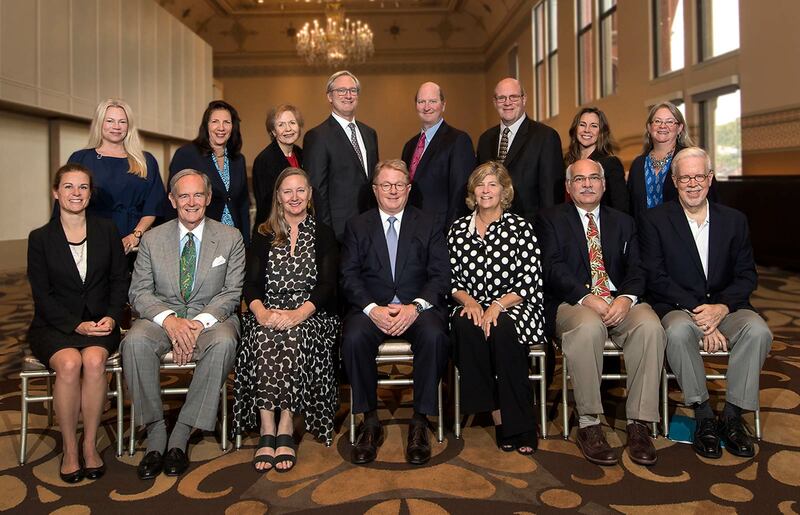 SPMH members, supporters, volunteers and partners – thank you for making this year’s Annual Meeting a success. 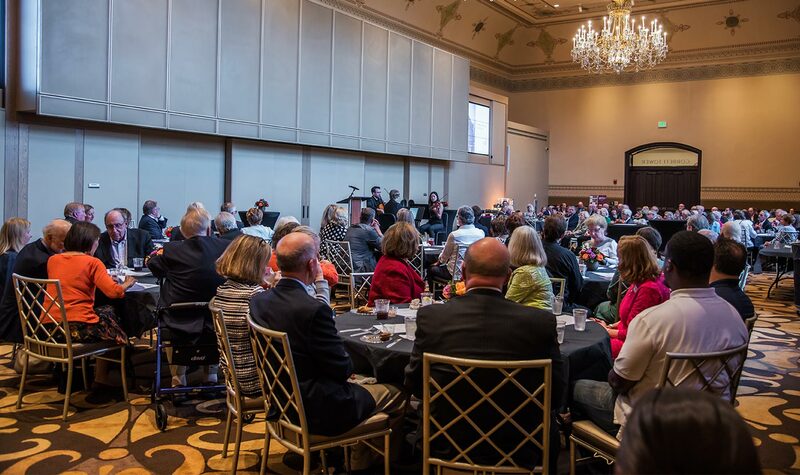 SPMH has been working for over 30 years to preserve and improve Cincinnati Music Hall, and to promote the facility and educate individuals from school age through adulthood on its history and purpose. Music Hall is a National Landmark of International significance and the premier cultural center of the Tri-State area. 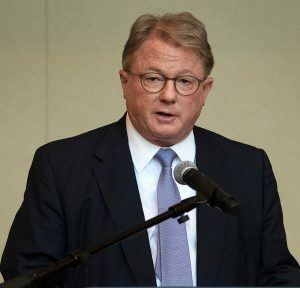 In acknowledging the organization’s work, President Peter Koenig thanks, the members and supporters attending the meeting, the resident companies of Music Hall, the Cincinnati Arts Association which manages Music Hall and the Music Hall Restoration Company. He thanked the board members, all of whom are volunteers, and specially acknowledged the amazing SPMH Program Guides and volunteers, each of whom brings their incredible skills and shared passion for Music Hall. In reviewing SPMH successful efforts, Peter cited the design of the room in which the meeting was held – Corbett Tower. The stenciling on the ceiling and the three tracery winders are a replication of Samuel Hannaford’s original design. He also mentioned the restoration of the black brick banding and design on the building’s facade, also underwritten by SPMH. Peter then previewed upcoming SPMH events. 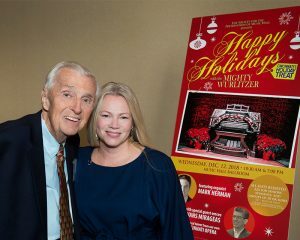 The Mighty Wurlitzer organ concerts were started by immediate past President Don Siekmann. Don originated and built a world-class series of concerts, which always sold out well before the concert dates. Don is retiring from SPMH. Board members Holly Brians Ragusa and Brett Stover are taking over the series. Tickets to these concerts are available now. Also in the works is a Charlie Chaplin Silent Film Organ Concert, which will be presented on May 9, 2019. Peter also advised everyone attending that SPMH is involved in strategic planning, which will include updating the SPMH brand. To that end, members and supporters are invited to present their ideas at one of two community engagement events that will be held on Monday, October 22. Download an invitation with additional information. Sign up here for one of the community engagement events. Four key members of the SPMH board have retired: Meredith Downton, Marcella Hsiung, Kathy Janson and Karen McKim. All were long-time members of the board. Each was exceptional in her service and their work and accomplishments have been key in the success of SPMH. Meredith joined the SPMH board in 2005 and served two terms at that time. She return to the board in 2012 and served two more terms. Meredith revamped SPMH’s tour program, expanded the tour guide base, and provided presentations about Music Hall to groups and meetings in our region. Meredith’s dedication to the preservation and promotion of historic structures reflects her commitment to our community. Marcella joined the SPMH board in 2004 and, with her experience in graphic design, jumped in immediately to drive marketing, lead events and design ads, flyers, and information brochures. 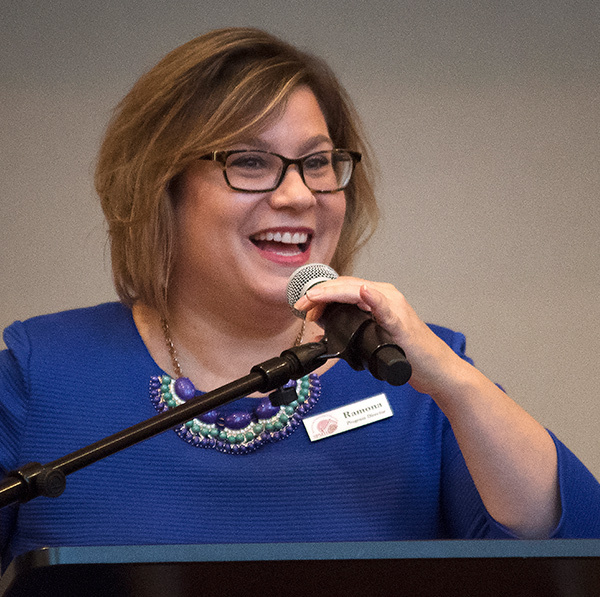 After Kathy Janson left the board, Marcella jumped in to redesign Music Hall Marks and lead the team in creating that twice-yearly publication. Marcella has been a VP of SPMH and served on the Executive Committee. Upon her retirement, she returned to her passion – painting. Her first new effort was chosen to be part of a juried art show. Kathy joined the SPMH board in 2006, and recently served as a Vice President and member of the Executive Committee. Until her retirement, Kathy produced and edited Music Hall Marks, providing SPMH members and supporters with news and information about our organization, Music Hall, and the resident companies. Kathy single-handedly led the effort to restore the art-carved organ panels, which were created in 1878 and covered the massive Hooks & Hastings organ. The panels are on display in the Taft Suite in Music Hall. Karen has been on the SPMH board since 1995, shortly after the organization received its 501 (c) (3) designation. She first worked as an advisor in her role as Executive Director of the Corbett Foundation. In 2000, Karen became SPMH Recording Secretary and member of the Executive Committee, and held that role until she stepped down last month. Her passion and commitment to SPMH and Music Hall is so strong that, in all those years, she attended every meeting and provided excellent counsel to the organization as a whole and as mentor to new members. The members of the SPMH Board of Directors is honored to have worked with Karen, Kathy, Marcella and Meredith and will miss them. Rick Pender’s name is well known in Cincinnati as a freelance writer for Cincinnati CityBeat – as well as serving as that publication’s Arts & Entertainment Editor – and writer for Soapbox Media, WCPO Insider, and other publications. In addition, Rick is the author of 100 Things to Do in Cincinnati Before You Die. 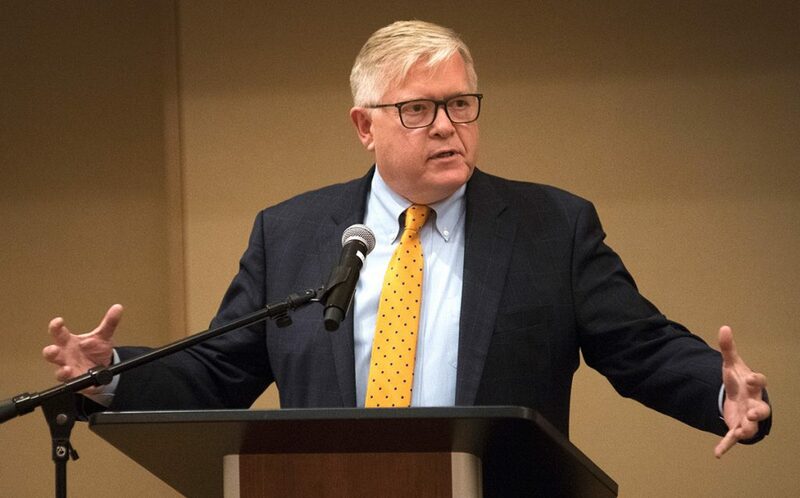 Rick’s career includes work in Public Relations and Communications, Director of Institutional Advancement for Cincinnati Opera, and, most recently, he led teams in fundraising and public affairs for Planned Parenthood of Southwest Ohio. Scott Santangelo joins the SPMH board as a director, after serving nearly 13 years as Music Hall’s Director of Operations. Scott once served as President of Santangelo Agency, a special events production company, and, after getting his law degree, became an attorney in general practice. He’s also active in his community, currently Chair of the Kenton County Joint Code Enforcement Board. Scott also compiled a book on the history of the Ohio Valley Jazz Festival, which was started by his father, Dino in the early 1960s and which has evolved into the nation’s top showcase of R&B performers. Rosemary Schlachter is the quintessential community volunteer. Her company, 25th Hour, is a public relations, marketing and fundraising firm that works with a wide array of businesses and nonprofit organizations requiring promotional and fund raising assistance. She’s been president of, or served on, dozens of boards in our community, including those of the Music Hall resident companies. Her success is reflected in the leadership awards she has received, including 1995 Post-Corbett Award co-recipient and Cincinnati Enquirer 1993 Woman of the Year. Below are the 2018-2019 SPMH Board of Directors. VP Ed Rider previewed SPMH projects currently underway: repairing or replacing the stone finials on the building and installing cresting which originally graced the roof of Music Hall. He then introduced special guests from CET. 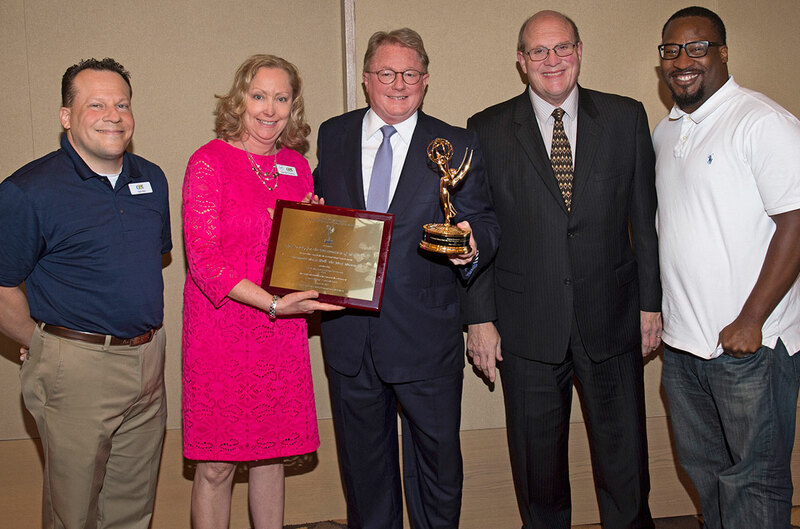 CET, Cincinnati Public Television, honored SPMH by presenting an Emmy award given to CET’s documentary Cincinnati Music Hall: The Next Movement. 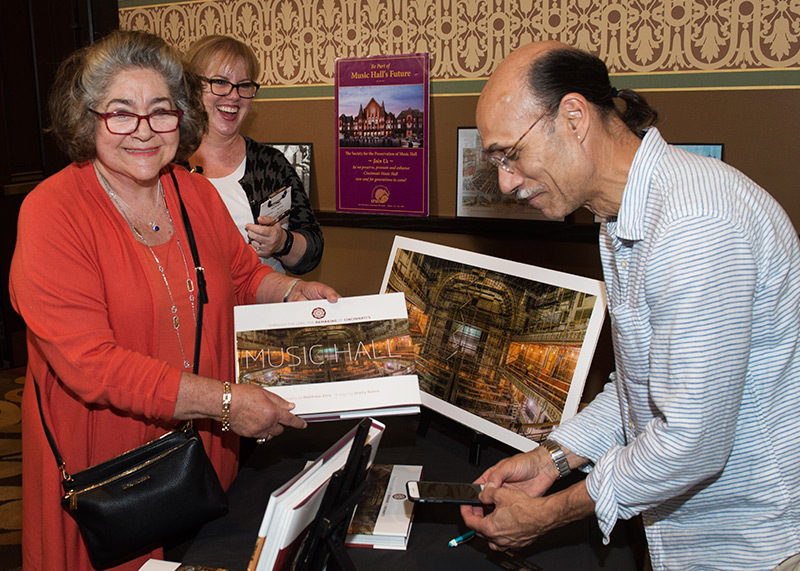 SPMH was the primary funder for the program and the partnership between our organizations will ensure that the history of Music Hall will be beautifully and accurately documented for future generations. Matt Zory, assistant principal bass player with the Cincinnati Symphony Orchestra, was available to sign his book. During the 16 months that work took place in Music Hall, Matt took photographs at every stage, of every area in the building. But it’s not all about the concrete, metal, wood, and pipes. Matt also features the craftsmen and women who did the work. His book features 275 images and includes text written by his wife Shelly Reese. Director Ramona Toussaint reported on the success of the Tours and Educational Outreach program. The program has shown tremendous growth over the last five years. A total of 313 tours/events were held, serving approximately 15,000 guests! Ramona attributes this success to the 30 Program Guides who research, write, train for and execute the programs. These programs not only include indoor tours – Backstage and Beyond – and outdoor/architectural tours – Beyond the Bricks – but also include speaking engagements in the community and classroom presentations. SPMH’s amazing volunteers have donated over 3,800 hours of their time in 2017 and 2018. Read profiles of our volunteers. Get information on becoming an SPMH volunteer. Just over a year ago, shortly before Music Hall reopened after the revitalization, Jonathan Martin assumed the presidency of the Cincinnati Symphony Orchestra. He’s been described as the Chief Evangelist Officer of the symphony, and spoke about the relevance of the orchestra in the 21st century, his vision for the future, and how the orchestra plans to evolve over the coming years. Jonathan indicated that the orchestra is currently undertaking long-range strategic planning and that the CSO Is working from a position of strength. Their “biggest enemy is complacency” and he admitted that looking at the future makes him nervous. 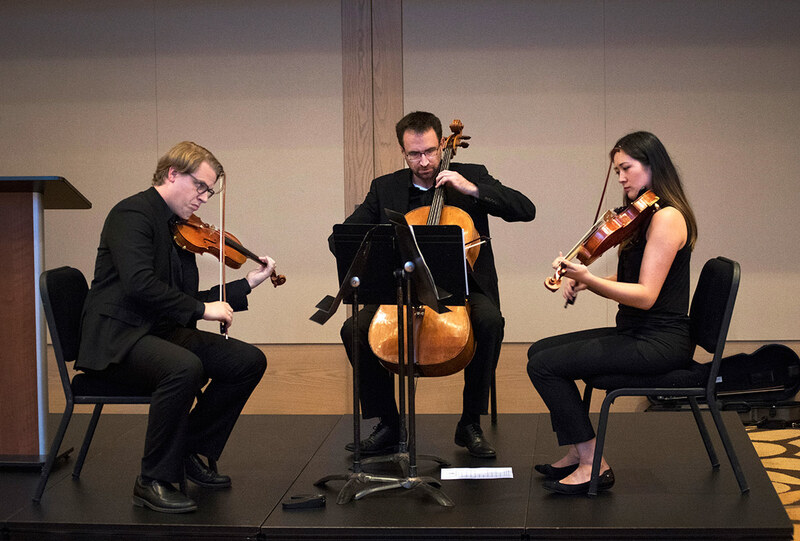 They are working on new programs and new approaches and in early 2019, they will release plans for the CSO’s 125th season. Jonathan also welcomed questions, one of which centered on the need to replace the pedestrian bridge between the city parking garage on the west side of Central Parkway and Music Hall. He said he gets that question – a lot. He explained that the decision hasn’t been announced as to what the city will do with that block. He added that trends in the Over-the-Rhine neighborhood will make it even more of a challenge to park. They are looking to see what other concert halls in restricted areas are doing to make it work. Special thanks to the members of the Cincinnati Symphony Orchestra’s Chamber Ensemble for their beautiful performance during the meeting. The musicians who performed: Philip Marten, violin; Caterina Longhi, viola; and Alan Rafferty, cello.